This will be the best chili you’ll ever make. Your belly will thank you. And, there is no need for beans since this All Meat and Veggie Paleo Chili recipe is so hearty you won’t even miss them, guaranteed. Chili is such a versatile meal that is great for dinner or lunch. It also pleases the whole family. If you are not following a strict Paleo diet, you can top it with cheese and sour cream. This is one of the meals included in my Family KickStart Program, so you are getting a special sneak peek today! 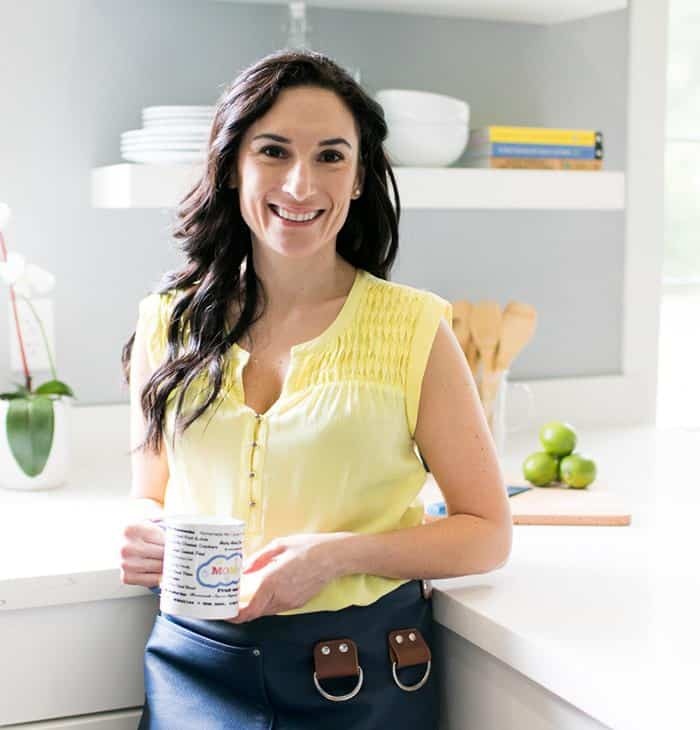 If you haven’t heard about Family KickStart yet, it’s the 30-day program I created to help busy families ours to eat real food together. 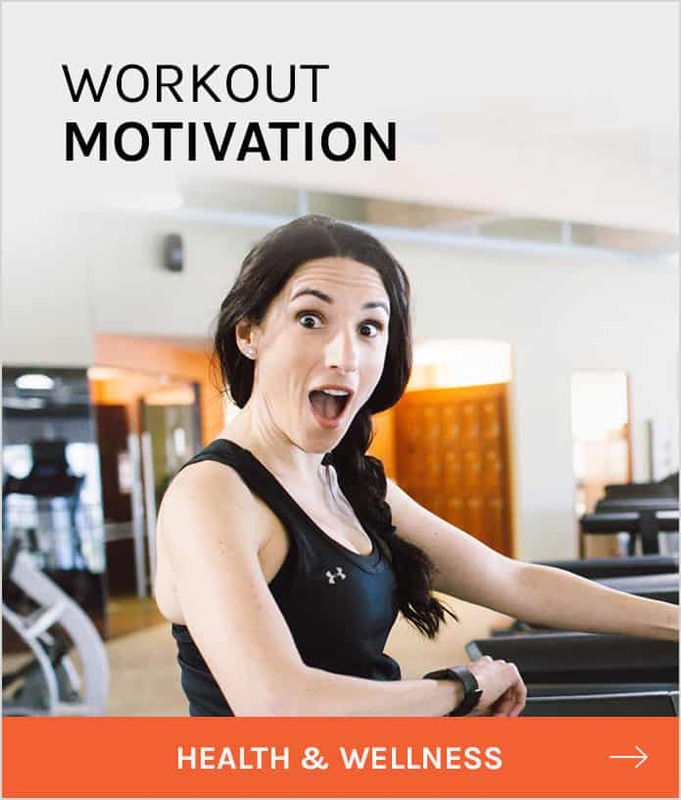 I’ve tried so many other 30-day or 21-day challenges and programs and all of them fell flat for me because they were set up for individuals and there was nothing there that my kids would eat. I knew there had to be a better way, so I created it myself! 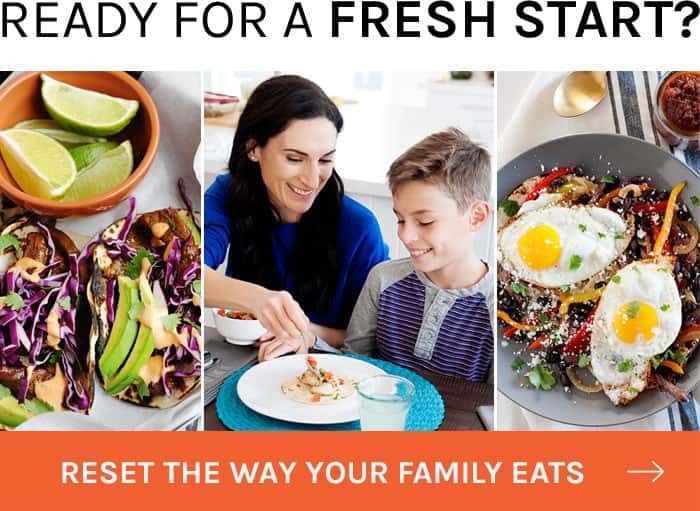 When you sign up for the Family KickStart Program, you’re given everything you need to succeed at eliminating sugars and processed foods as a family. 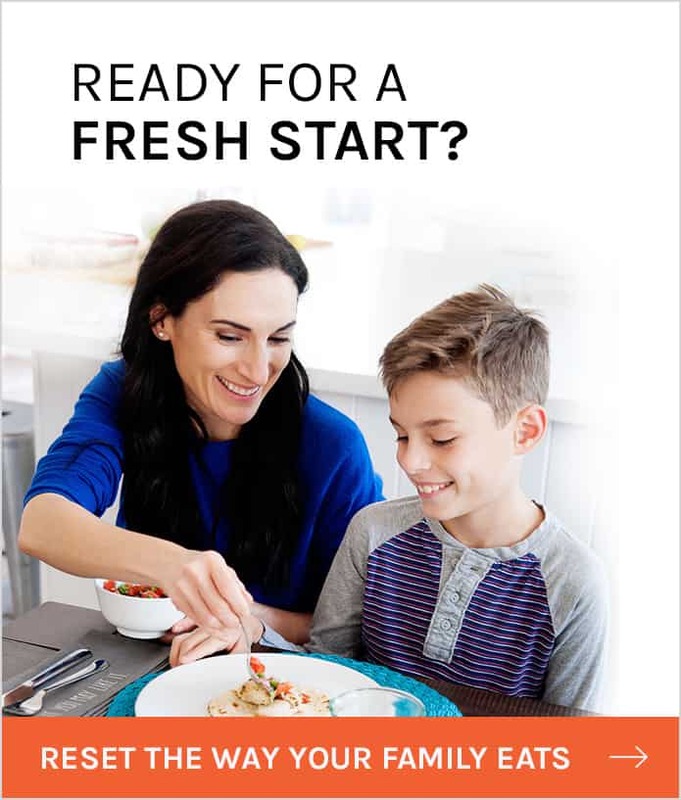 This includes over 50 recipes, meal plans, and even shopping lists to help make the process painless for you and your kids! Learn more about the Family KickStart Program here! One of the reasons I love this recipe is because I get my chili fix without the need for beans. That’s right, full flavor and no beans. I tweaked the seasonings for over two years until I came up with, what I think is, the perfect balance of smokiness and heat. 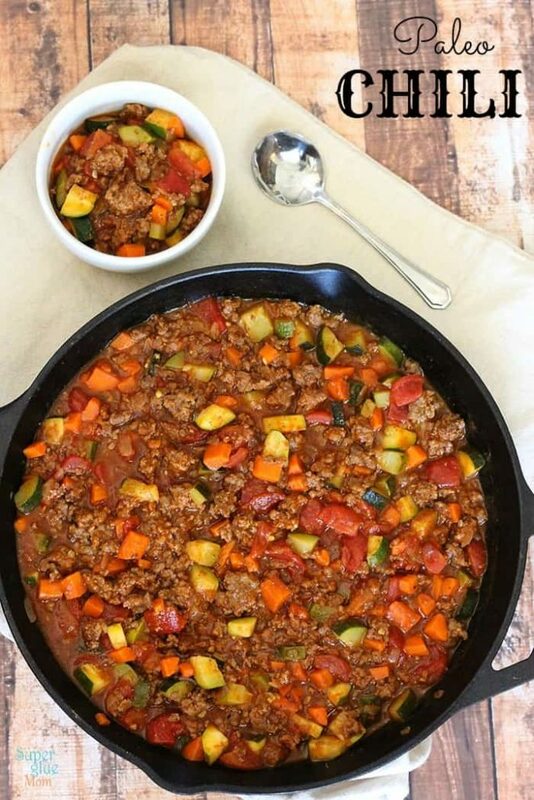 I love cooking this chili on a large cast iron skillet (as shown) or a Dutch oven. I really think the cast iron’s ability to hold the heat helps the seasonings penetrate the meat and veggies. Do you know what else is great about this recipe? You can brown your meat and throw it all inside a slow cooker, for 4 hours on high or 6-8 on low and it’s a zero fuss way to eat chili. You are welcome. Although I eliminated the beans in this recipe, all the hearty vegetables add the filling volume our hungry bellies want and need. Plus, it’s super colorful and looks gorgeous when served, not to mention delicious. This chili is very thick. If you want to make it more soup-like, add 2 cups of stock to thin it out. It’s the perfect topping for baked potatoes or sweet potatoes. My kids don’t eat it as is so I used the mini-chopper to finely chop all the veggie chunks and topped their pasta with it for what they call: chili-pasta. Win-win! You know why else I love this chili? Because I can make this recipe ahead of time and after a long day of work I can have a quick hearty meal. You can read many of the comments below, they all agree that this chili tastes better a few days later! Try it once and make sure you double the recipe and freeze extras. 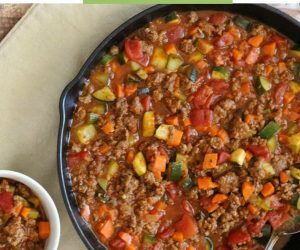 And when you are done with this paleo chili, you can try one of my other dinner ideas. 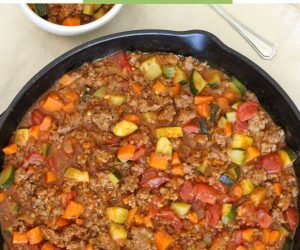 Whether you don’t have some of the veggies around, have picky eaters who don’t eat carrots or zucchini, or you simply want to make the most out of this recipe and add variety, the following are great substitutions and add-ins to this recipe. Some of my readers have found that replacing the carrots with sweet potatoes is a great option if you have kids who don’t eat carrots or want to up the carbohydrate count of this recipe. Add 8 ounces of mushrooms to the recipe when sautéing the veggies. They’ll add a delicious earthy flavor to the recipe. Substitute the zucchini with butternut squash, either fresh or frozen. 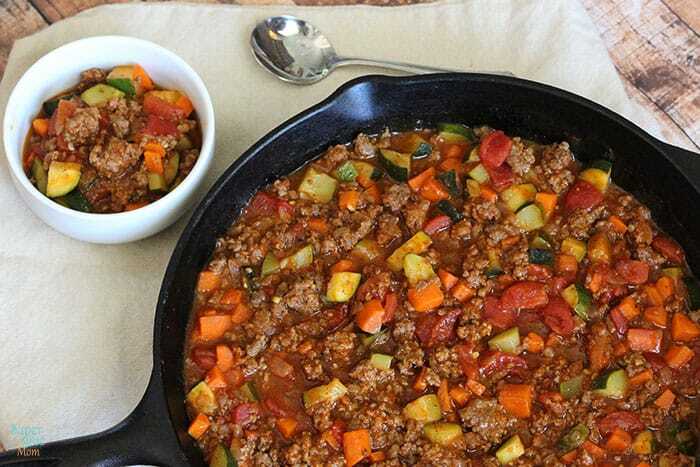 Substitute the ground beef with ground turkey or chicken. However, the latter has very little fat so the chili might be a bit dryer in texture. Replacing the ground beef with chicken is also a popular choice, however, the recipe will vary a little so I went ahead and created the Paleo Chicken Chili Recipe in this post. Add 2 to 4 additional cups of broth or stock to this recipe to make it more soup-like. The chili texture is thick. Many of my readers have loved this chili recipe so much that they’ve replaced the ground beef with 2 15-ounce cans of black beans to make it a vegetarian meal. In addition, some have used cubed tofu in this recipe and kept it vegetarian with no beans. Add 1/2 to 1 whole finely chopped jalapeño when sautéing the veggies for added heat. This chili is rich and smoky not very spicy. This recipe freezes very well. I like to freeze leftovers in 1 cup to 1 1/2 cup servings for quick lunches or single-serve dinners. Of course, you can fill leftovers in a gallon zip bag and freeze for another dinner. 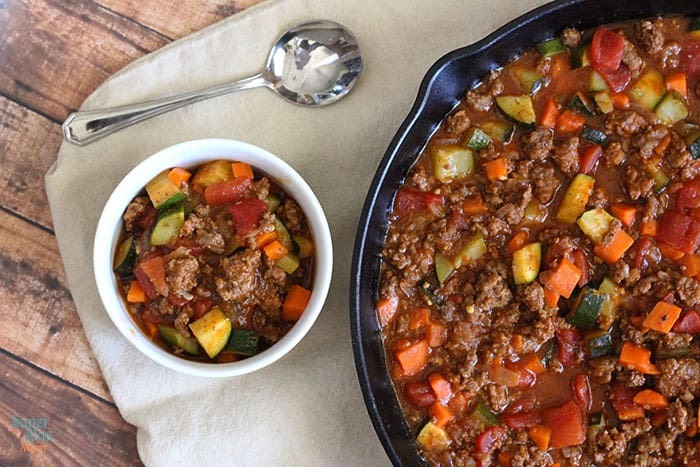 You can make this paleo chili recipe in the slow cooker after you brown your meat. 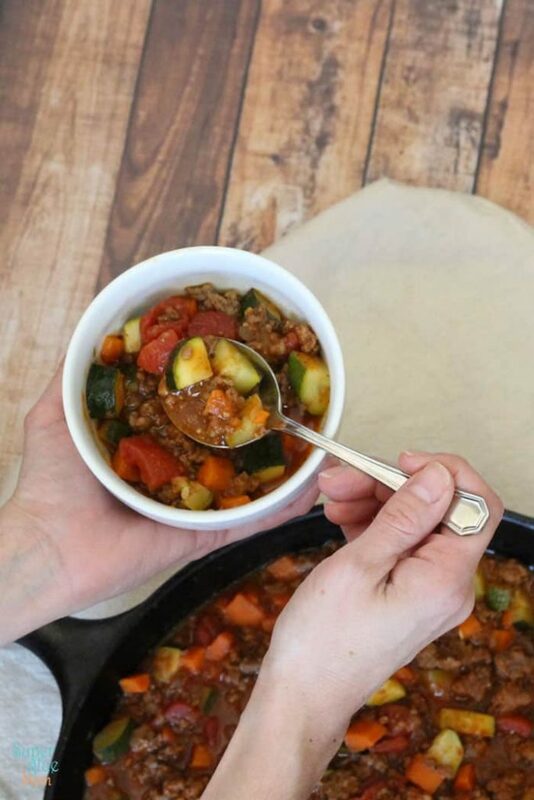 For the full recipe and directions on how to do that, I have a Slow Cooker Paleo Chili Recipe right here if you want to make the whole thing that way. 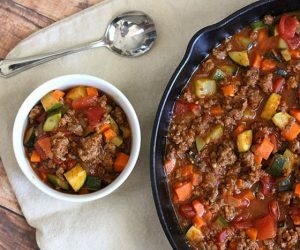 Make this paleo chili recipe a day or two ahead before a party and store in the refrigerator. The day of the party, simply warm it up and keep it “warm” in your slow cooker so your guests can serve themselves or in a large pot on your stove on the lowest setting. Most of us think it tastes better the next day! Brown your meat in the Instant Pot and then add all remaining ingredients. Cook for 10 minutes and it’s ready. The only downside of cooking this recipe in the Instant Pot is that the zucchini will be cooked a lot and very soft. For this method, I recommend substituting the zucchini with diced sweet potatoes. Cuisine: Just great food. Hands down. In your seasoned skillet or 5-6 quart large cast iron pot, brown beef and garlic. Cook over medium heat until beef is thoroughly cooked and browned. Drain off excess fat, set aside. Add oil, onions, celery, carrots, and seasonings to the skillet and cook until translucent over medium-high heat, about 5-7 minutes. Once onions are golden and veggies are midway cooked, add zucchini and cook for 2 minutes, making sure you stir everything well. Add cooked beef, tomato puree/sauce, and tomatoes into the pot and stir well. Bring everything to a boil, stirring frequently, reduce heat and simmer for 20 minutes. Check on the amazing mixture every so often and stir. Serve immediately. This is a very thick chili recipe. Add up to 1 cup of additional liquid (tomato sauce or water) to thin out the sauce if you prefer. Made this chili tonight, and it is SO SO SO good! We used ground turkey instead of beef- still soooo delicious! Will definitely be making this again!! I know exactly what you mean! I’m currently in UT and we’re at a high of 10. making me wish I had some of this! -had it last week when it was in the 30s and now I’m like… should have saved it! I am so happy to have found this recipe! 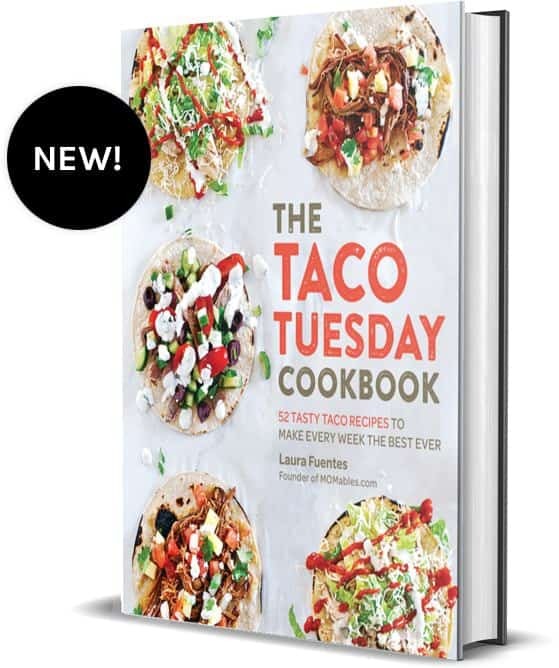 I cant wait to make it tonight in my Instant pot!! Love this. I change up the veggies and love to serve over cauli-rice and spinach! This was amazing!!! I cannot wait to eat the leftovers for lunch !